However it’s always better to add options and mounting points before you simplify since it’s so easy to remove them afterwards. Try to think of all the possibilities so you’re able to add on more motors later without any danger of interfering with what is already in place. So 8 castor wheels may look excessive but it’s only a model and easy to delete. Adding them later on might prove trickier. 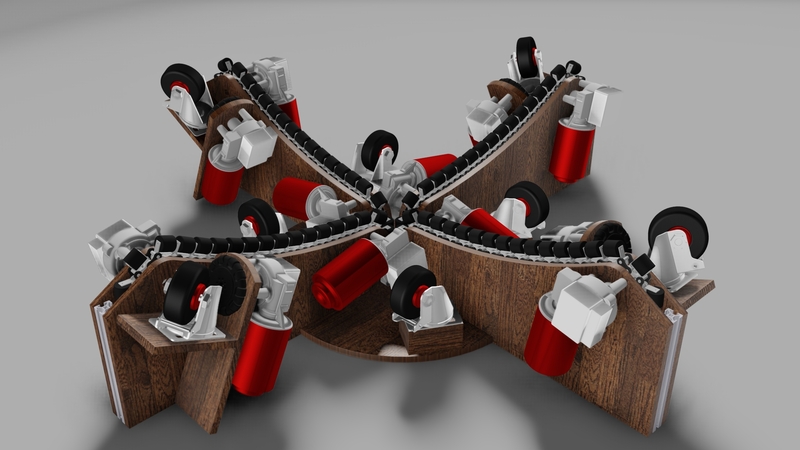 I’m designing for big people, not everyone will need so many motors, but if you do the design is ready for you. The chain sprockets are fixed at the moment but I intend to make them push the rollers up against the sphere if at all possible. It might be simpler to mount the castor wheels onto some springs to achieve the same effect since they have the advantage of not being tied to a motor… regardless, good traction is very important.